We are engaged in manufacturing and export of an extensive range of polymer products that find application in various industries. Fabricated using superior quality materials like UHNWPE, Cast PU (cast polyurethane), these products are appreciated for durability and fine finish. Our product range includes Polysteel, Round Plates & Bushes and Rods. We provide a range of quality rods that are fabricated using optimum quality self-lubricating materials like UHMWPE, peek and polyurethane in compliance with set industrial standards. These rods are appreciated for chemical and corrosion resistance, excellent thermal and electrical insulation and low moisture absorption. 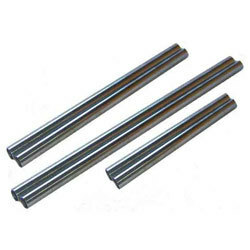 Our product range of high performance rods are demanded in various industries like chemical, textile, paper-making, lining and waste water treatment plants.